RuneScape giant Jagex has said it wants to grow its studio staff count by 25 per cent during 2019 as it announces two senior hires. Dan Vargas (right) has come on board as art director for that unannounced online action RPG that we keep not hearing anything about. He joins with a CV that includes stints at EA and Ubisoft, having worked on both the Assassin's Creed and Need for Speed: Underground franchises. He is joined by technical director Ian Thomas (far right) who is joining the Cambridge studio's publishing platform team. Prior to this, he was director of engineering at, erm, 'employee engagement tool' Glint. 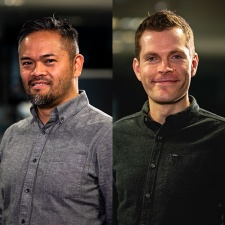 “Jagex continues to attract and secure industry-respected expertise and Ian and Dan are key hires who will strengthen our creative and technical management teams," Jagex boss Phil Mansell said.